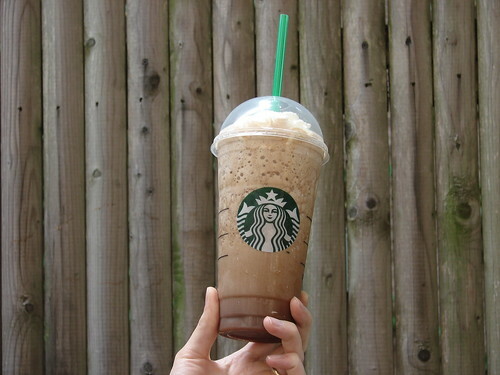 Here's the order: a Venti Quad Mint Mocha Frappuccino. Now you have an $8.75 drink plus tax bringing your total to $9.53. Not quite as much as this $20.65 drink that involves 22 shots and a pump of every flavor of syrup, but then again you might actually want to drink it. The four shots of espresso tones down the sweetness of the frappucino and expands the drink volume a good deal and the Park Slope Starbucks very nicely gave me the extra beverage in a grande cup (it was about 2/3s full). You'd better believe I'll be ordering this again. Isn't there a trente (30 ounce) size for cold drinks now? I want to try this but I'm scared. i ended up getting 2 free drink cards for my birthday and dont even use starbucks cards anymore. I just get 4 shots over ice instead of my usual 3. This? IS AWESOME! Thanks for the tip! I go to Starbucks on the daily to sponge off of their Wi Fi (like now) and just order a tall or grande hot or iced coffee so I feel like I'm always getting free drink coupons. I'm all about getting the most bang for my buck.